You can find information about our dining bar on the Bravo24 page. Out of office? You also can contact us trough the form below. Indoor Skydive Roosendaal is open every day of the week. Different opening hours for Indoor Skydive Roosendaal apply on public holidays. 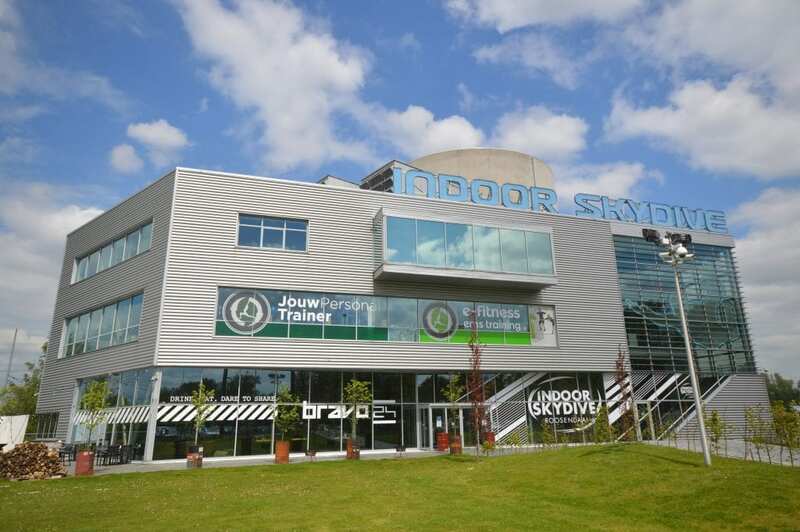 * Note: Indoor Skydive Roosendaal and Bravo24 may be closed at any time because of an exclusive booking. So always check with us to avoid disappointment. We are daily available on our office telephone number between 09:00 – 21.00 hour. On Sunday till 18.00 hour. Indoor Skydive Roosendaal is easy to reach from all directions. Indoor Skydive Roosendaal can be found on Recreatiepark de Stok in Roosendaal. From Roosendaal station take bus 112 towards Bergen op Zoom or local bus 104 direction Bergen op Zoom. Get off at the stop Rosada / Outlet Centre. Then it’s about 15 minutes walk to Indoor Skydive Roosendaal. You walk back to the crossroads, past the recreational swimmingpool ‘de Stok’. Indoor Skydive Roosendaal is located at the end of the street.